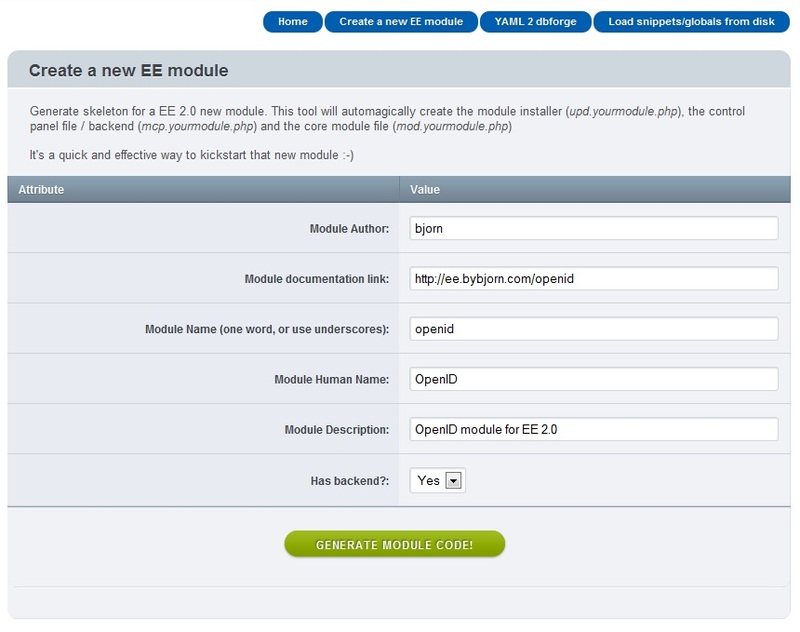 I’ve spent the last 8 months developing modules (and templates) for EE 2.0. Pretty early I got annoyed by some of the redundant manual tasks I had to do over and over again .. so I started creating some addons to help me out. Now I’ve bundled (some of that) functionality in this thing I’ve named DevKit for EE 2.0, download it here: zip / github page. 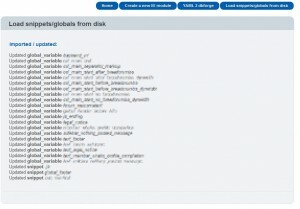 Also it has a one-click load of snippets and global variables from the filesystem. Personally I like to use the built in EE functionality to add that to the main navigation at the top, so that when updating the global variables in my files I just hit that button and they’re all updated. 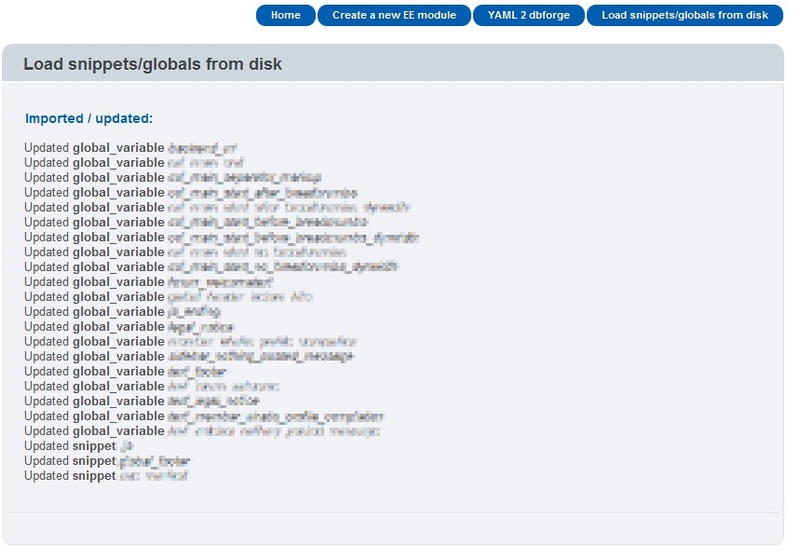 And then there is a YAML 2 dbforge generator that will help you out when you have a lot of database tables you need to generate (this is handy for the upd.yourmodule.php install() and uninstall() functions). 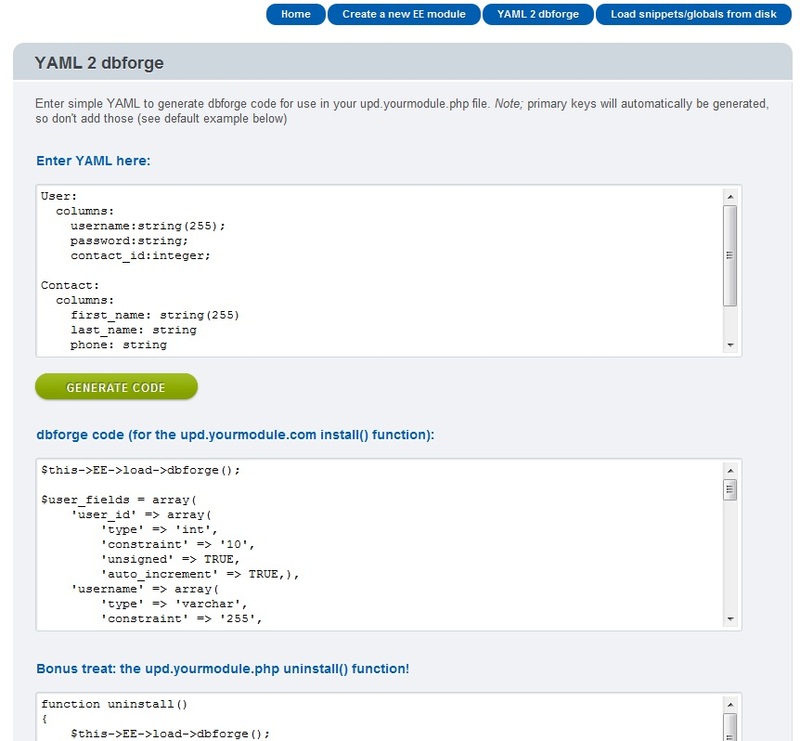 Personally I’m too lazy to write dbforge code, YAML is quicker (see the screenshot). This is very basic, but it works. I hope that other EE developers find this helpful. If you do, please let me know, and also – if you’d like to contribute / help out improving this DevKit let me know and I’ll add you to the project on github so you can commit code to it. This is a small step for EE, and a humble start, but maybe this can evolve into an awesome tool / framework for EE 2.0 development. Looks fantastic. I can’t wait to test it out! Any chance of posting a quick tutorial for creating a very simple module? Just out of curiosity, did you try using the ‘Hermes’ add-on from Solspace before going down this route? Brandon; creating a simple module is only a matter of filling out the form ;-) .. but yeah, writing a newbie tutorial is a pretty good idea. Martin; yeah I recall checking out Hermes a while back – but that’s only for 1.6.x … DevKit is for 2.0. Right in the nick of time! Thanks. Nice work! I, too, would love to see a tutorial of this in use. Maybe even a screencast? Thanks so much! That looks great, I’ll certainly use it in my first module :D Thanks for your work ! I downloaded the files but how do I install them? they’re not in the format of third_party/devkit and putting the two included directories into third_party/devkit/ doesn’t seem to work. Am I missing something? sorry about the previous comment, I got it sorted. This thing is amazing. I am writing my first module and already have all of the tedious stuff done. Great job on this! WIll let you know when I have my module completed. great addon, any support for extension generation? Have you considered having devkit be able to generate a skeleton Accessory, Extension or Plugin too so that it is a more complete toolkit? You could put in a couple of common functions in them for accessing params and stuff. I know it’s on the EE site but it would speed things up for people i would imagine. This is an awesome module thank you. Maybe you could add a tab file generation in your next update? Please update!!!! I love this thing! An update might be warranted. I can’t get this add-on to work with a fresh EE 2.5.2 install. Anyone else having this problem? There was life before you… and now there’s life after you. I hate EE so much, YOU made it 99 % less bad ! Hi All, I am new to EE,can you please help me in installing the above module.I mean to say where to put the two downloaded folders?